Be the first to share your favorite memory, photo or story of Dr. Warren. This memorial page is dedicated for family, friends and future generations to celebrate the life of their loved one. 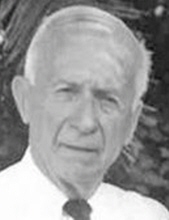 Warren Charles Campbell M.D. went peacefully to be with his Lord Saturday, March 16th, 2019, surrounded by his family. He was 91 years of age. Warren is survived by his wife of 68 years, Lucy Parent Campbell, and their children: Daniel Warren Campbell, (wife, Cynthia Jensen Campbell) Susan Campbell Skidmore (husband, Jay Vyn Skidmore, PhD. ), and grandchildren, Robert Vyn Skidmore and Nathan Skidmore. He was preceded in death by his parents, Homer Edgar and Beulah Florence Campbell, and a brother Homer Edgar Campbell Jr.
Warren was born in Nebraska in 1927 and as a child moved with his family to Arvin, California where his father established the "Valley Mercantile" store. After graduating from Bakersfield High School, Warren enlisted in the Navy (This was near the end of WWII). After the Navy he pursued his dream of becoming a doctor. He did his undergraduate work at UC Berkeley, then completed Medical School at what is now UC Irvine. He interned at Los Angeles County Hospital, completed three preceptorships including anesthesiology, obstetrics, and orthopedics to specialize in rural medicine. He is a lifetime member of the American Academy of Family Physicians. After receiving his medical license, he devoted several years to the development and staffing of a small hospital on the Navaho Indian Reservation at Rock Point, Arizona. In Quito Ecuador, he served at Hospital Vozandes, a teaching hospital where he took part in medical missions reaching people in the High Andes Mountains and in the remote Amazon jungle. Returning to the United States, he completed a General Practice Residency at Contra Costa County Hospital in Martinez, CA. He accepted the invitation of Dr. Leavenworth, Director of the Sutter County Hospital and moved to Yuba City to work with the Sutter County Migrant Clinics associated with the county hospital. In the early 1970's the estate of a local physician, Dr. Arthur Jones and his wife who had gone missing in a boat incident, approached Warren to take over his existing private medical practice, which he did and it was a happy match. Due to his love for flying and all people that shared his passion, he chose to enlist in the USAF and was sworn in as a Lt. Colonel, flight surgeon. He could not find another Dr. to fill his practice, so mercifully the USAF let him off the hook. Later, Dr. William Dabney joined his practice for a period of time and Warren continued his practice in Yuba City until his retirement. After retiring from his Yuba City practice but maintaining his residence in this town, Warren worked in many other medical practices throughout the US as a "locum tenens" professional. During this period he also worked in Yuba City with Sutter North Health. He retired permanently in 2010. In addition to Warren's professional life, he was passionate about flying his own airplane, loved gardening, cross-country skiing and bicycling. He and Lucy were often found biking around Lake Tahoe in the summer or skiing the mountains in winter. Above all, Warren's passion for healing extended beyond the physical, as he keenly felt God was the Great Healer, and that a person's spiritual condition was equally or more important to the healing process. We will remember Warren for his loving challenges to live right, love well and follow God. In lieu of flowers send contributions to Yuba Sutter Young Life, Box 344, Yuba City, CA 95992. Services will be held Saturday, April 6, 2019 at 11:00 am at The Bride Church, 1321 Peach Tree Lane, Yuba City, CA. To send flowers or a remembrance gift to the family of Dr. Warren Charles Campbell, please visit our Tribute Store. Military Honors will be provided by the United States Navy Honor Guard. "Email Address" would like to share the life celebration of Dr. Warren Charles Campbell. Click on the "link" to go to share a favorite memory or leave a condolence message for the family.